Over their relatively long lifetime, hematopoietic stem cells (HSCs) suffer from a barrage of stresses and strains, including DNA damage, replication stress, and ribosomal stress [1, 2], that culminate in the age-related loss of functionality. These deficiencies become problematic in the setting of bone marrow stem cell transplantation [3-5] and have led to the search for strategies to “rejuvenate” aged HSCs. 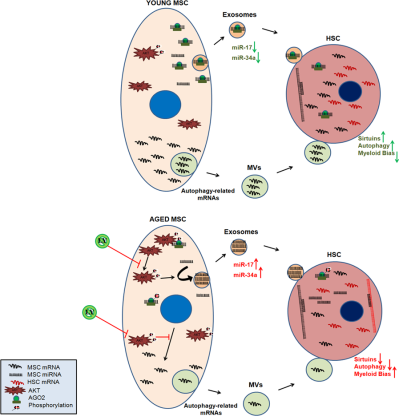 Now, new research from the laboratory of Vaijayanti P. Kale (National Centre for Cell Science, Pune, Maharashtra, India) has described a fascinating new approach to return lost functionality to aged mouse HSCs: the transfer of microvesicles (MVs) containing positive regulators of autophagy derived from young mesenchymal stem cells (MSCs) . Can young MSCs or rescued MVs turn back the clock of aged HSCs and improve bone marrow stem cell transplants in human patients? Stay tuned to the Stem Cells Portal to find out! What mechanism(s) cause elevated Akt signaling and differential miRNA partitioning during aging? What other signaling pathways are important to MSC-mediated HSC rejuvenation? Can this strategy be transferred to human patients requiring bone marrow stem cell transplants? Beerman I, Seita J, Inlay MA, et al., Quiescent hematopoietic stem cells accumulate DNA damage during aging that is repaired upon entry into cell cycle. Cell Stem Cell 2014;15:37-50. Flach J, Bakker ST, Mohrin M, et al., Replication stress is a potent driver of functional decline in ageing haematopoietic stem cells. Nature 2014;512:198-202. Kollman C, Howe CW, Anasetti C, et al., Donor characteristics as risk factors in recipients after transplantation of bone marrow from unrelated donors: the effect of donor age. Blood 2001;98:2043-51. Woolthuis CM, Mariani N, Verkaik-Schakel RN, et al., Aging impairs long-term hematopoietic regeneration after autologous stem cell transplantation. Biol Blood Marrow Transplant 2014;20:865-71. Mehta J, Gordon LI, Tallman MS, et al., Does younger donor age affect the outcome of reduced-intensity allogeneic hematopoietic stem cell transplantation for hematologic malignancies beneficially? Bone Marrow Transplant 2006;38:95-100. Kulkarni R, Bajaj M, Ghode S, et al., Intercellular Transfer of Microvesicles from Young Mesenchymal Stromal Cells Rejuvenates Aged Murine Hematopoietic Stem Cells. STEM CELLS 2018;36:420-433.